The National Leader of the All Progressives Congress, Asiwaju Ahmed Tinubu, has demanded the removal of the party’s National Chairman, Chief John Odigie-Oyegun, over what he called the latter’s anti-democratic handling of the party affairs. 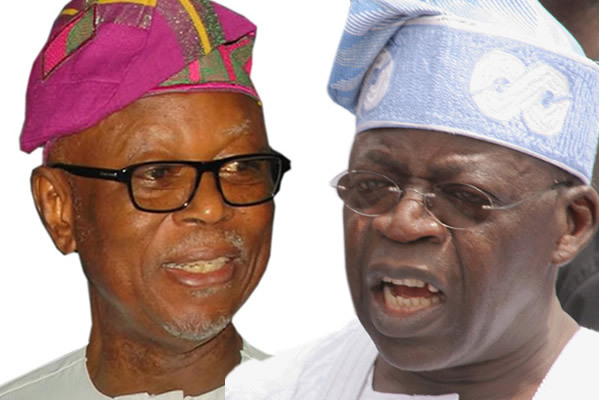 Tinubu made this demand in a scathing statement entitled, “Oyegun’s Ondo fraud: The violation of democracy in the APC,” released by the Tinubu Media Office on Sunday. The party leader said the APC’s democratic credentials had been dealt a big blow by Odigie-Oyegun’s conduct, especially with his handling of the outcome of the Ondo State governorship primary. He said the APC was a party borne out of the quest for democratic good governance, arguing that the ideology was currently under a critical threat by those who managed to be in the party but were never part of it. According to him, from the party’s inception, the principles of democratic fairness and justice are to guide the APC’s internal deliberations. He stressed that the party’s founders realised that it was only by fair dealing that the party could remain faithful to the progressive ideals that were presented to the Nigerian electorate as governing creed. “If the party can not justly govern itself, it will find it difficult to establish and maintain just government throughout the nation,” he said. The APC leader stressed that before now, the party was the embodiment of a democratic promise made between its members as well as a democratic vow made to the public. Tinubu said, “Evidently, some errant members believe that promises and vows are mere words to be easily spoken and more easily broken. Chairman John (Odigie-) Oyegun has breached these good pledges in a most overt and brazen display. “In doing so, (Odigie-) Oyegun has dealt a heavy blow to the very party he professes to lead. It is an awful parent who suffocates his own child for the sake of a few naira. On the just concluded Ondo State governorship primaries, Tinubu said, “(Odigie-) Oyegun’s comportment regarding the Ondo State primary will become the textbook definition of political treachery and malfeasance of the basest order. “In early September, the (Ondo) State primary was held. A purported winner was named. Having faith in the ways of the party, Tinubu publicly accepted what he assumed to be a verdict honestly derived. The APC leader said one of the few bright spots during the conduct of the primary was the Jigawa State Governor, Alhaji Mohammed Abubakar, whom he said chaired the primary convention with decorum and impartiality. He noted that he (Abubakar) was unaware that a tampered list had been slipped into the process. Tinubu added, “Indeed within hours of the announcement, news began to filter in that gravely disturbed me. Credible allegations of fraud troubled the waters. “The delegate list had been materially altered by someone in a strategic position to do so. The names of over 150 valid delegates were excised to make room for an equal number of impostors. The APC national leader narrated details of what transpired behind closed doors during the NWC meeting, held to deliberate on the report of the appeal panel saddled with the responsibility of handling the appeals. He accused Odigie-Oyegun of upturning the decision of the majority who voted in favour of the cancellation of the primary and the conduct of a fresh one. Tinubu stated, “He has shown that he and democratic fairplay cannot exist in the same party at the same time. Attempts to get the reaction of Odigie-Oyegun were unsuccessful. He neither picked nor returned several calls made to his line. A response to a text message sent to him was still being awaited as of the time of filing this report.